I am a real water baby and I absolutely love all forms of water including oceans, waterfalls, lakes, ponds and rivers. I prefer naturally occurring water over, say, swimming pools and fountains but as long as I can hear the soft gurgling or tinkling of running water then I am happy. It is no surprise then that I found something so appealing and romantic in the Roman Baths in Bath. The source of the water is from natural, hot springs emerging from underground but it is the Roman buildings erected at the site in the first century that add up to make this the most unforgettable place to visit. 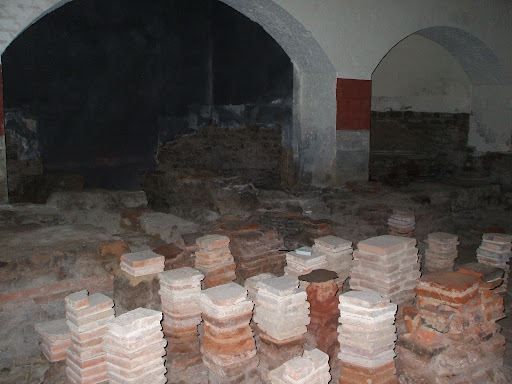 They estimate that only a fraction of the the original baths have been excavated but they are able to reconstruct portions of the structure to give you an idea of how it might have looked two thousand years ago. The Romans could not explain the source of the hot, rapidly flowing water emerging from underground and so they deemed it to be of divine origin and they built a temple and shrine around the springs. 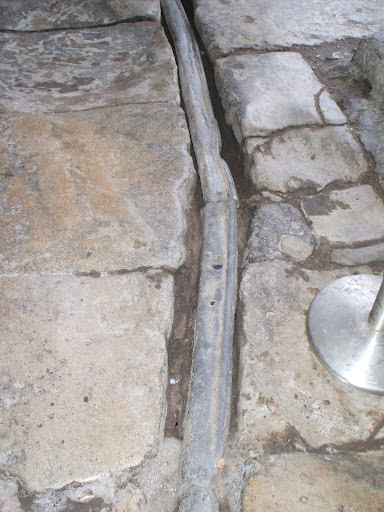 In these photos, you can see the original water level of the Roman era. 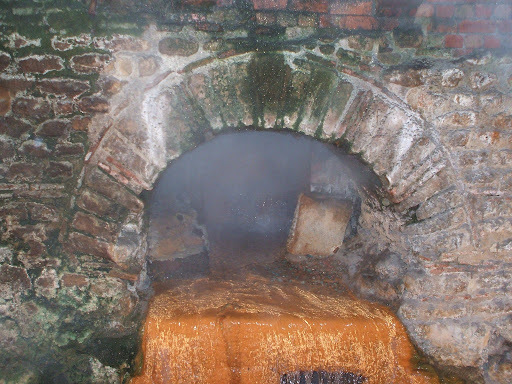 The copper-coloured ring around the Sacred Spring shows the water level in the 18th century. 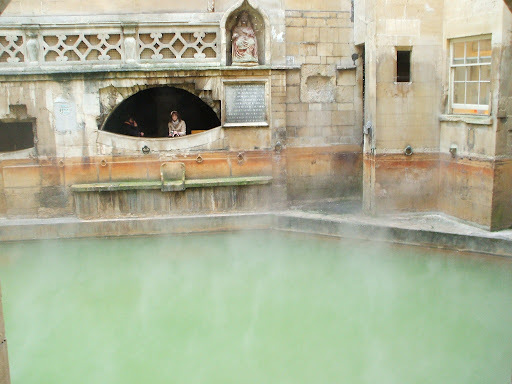 The baths (and the whole city of Bath) became a much sought-after location in the 18th century as wealthy patrons sought healing in the baths and Bath developed as a prestigious spa town. 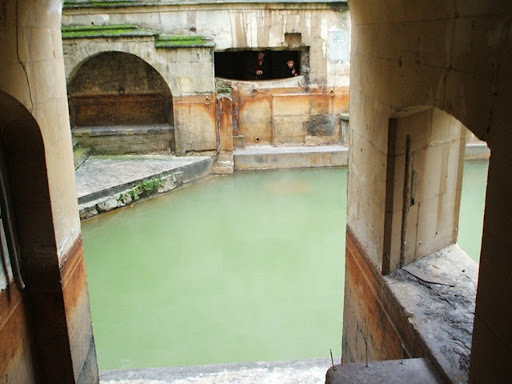 The Romans built the stone reservoir around the Sacred Spring and thus used the water to feed the baths. 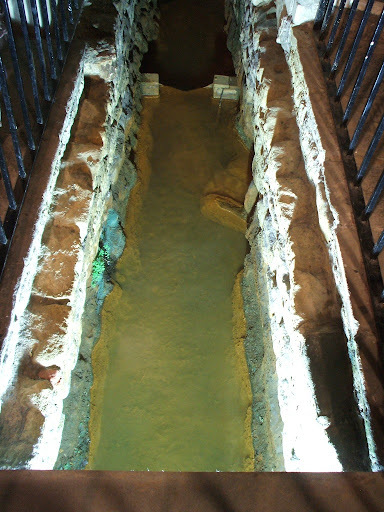 This is the original Roman drain which still takes the hot water from the spring to the river Avon a few hundred metres away. The flow is a constant 13 litres per second which amounts to 1,170,000 litres a day. I could have taken a score of photos by the side of the Great Bath, I thought it was that beautiful. Oh wait, I did! It's really hard to appreciate the baths from these photos because it looks like a couple of piles of stones and holes in the ground! 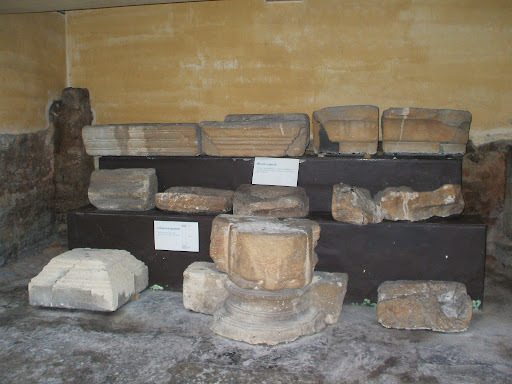 But those piles of stones used to support the floors and allow heated air to flow through, thus heating the rooms in the first instances of central heating. 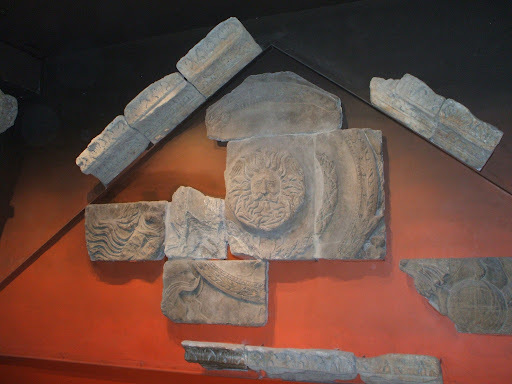 There were various pools and the first instances of steam baths and resting rooms. 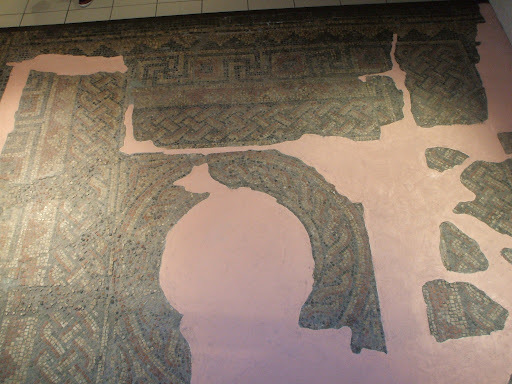 These were absolutely decadent times and you can almost imagine the shenanigans the ancient Romans got up to in the various nooks and crannies in the compound. 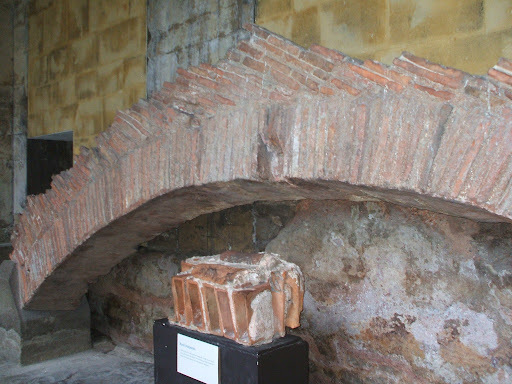 Original roof tiles; an original lead drain; an original Roman occupant*; part of the original roof facade. * Okay, not really. Just checking if you're concentrating. That is a wonderfully authentic tour guide. The rings on the walls were left by grateful 18th century patrons who claimed to have been healed from all sorts of ailments. We threw some coins into the pool and I made a wish that I'd get over the flu! 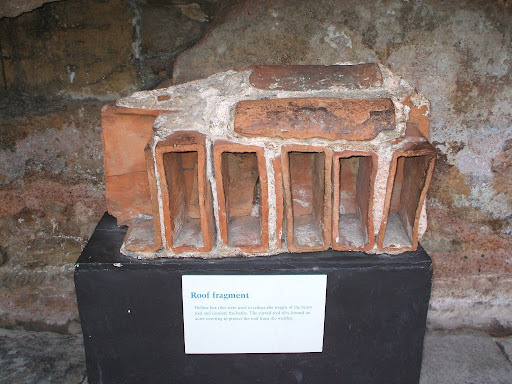 Great posting Emm, I would love to visit these Roman baths one day!! So sereen and ancient! @ Mireille: Yeah - they were great! Serene is the exact description... very calming. @ Ivanhoe: Thanks for stopping by. Happy new year to you and your family too! According to chinese tradition, 2009 is OX(牛）year, OX means growing, Yeah, A growing year! So Happy 牛 Year to you! @ iWalk: I was born in the year of the Ox!!! Happy new year to you too! @ Angie: Hiya! Thanks for stoping by. How long were you in London for? Are you permanently in Switzerland now? Your blog looks great - have you stopped updating?? Emm, I hope you have a wonderful and blessed New Year! @ Jodi: Hiya. A wonderful new year to you too. I hope everything goes a lot better for you this year! 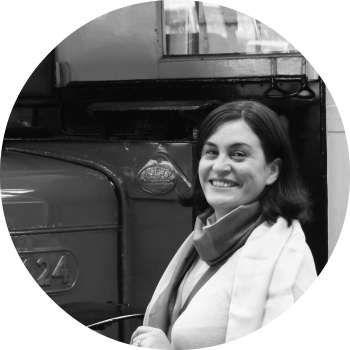 Hi Emm, a BIG THANK YOU to you! I was in London for ages before I moved back to Malaysia. Then a twist of fate brought me to Switzerland. Following my husband's expat posting, I now end up in Singapore. @ Lynne: Thanks for stopping by! I apologise for the delay in replying to you - I have been in bed with flu for a week and so am just catching up. Did you get to try the Bath water when you went? Tastes absolutely awful ;) Supposed to be good for you, I dunno. 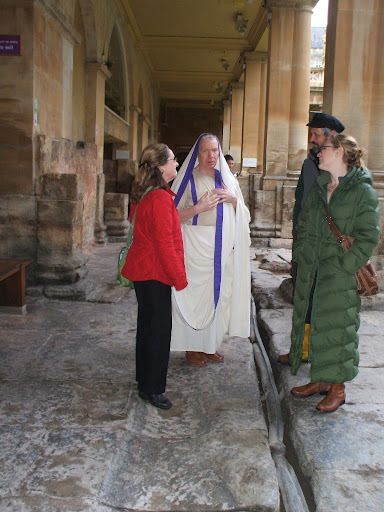 We didn't have any of those tour guides around when I went to the Roman baths, too funny!